Todays bag is quite possibly the only street bag I have featured with pepper spray inside. It must get pretty hairy shooting the streets of Warsaw. Come and check it out. 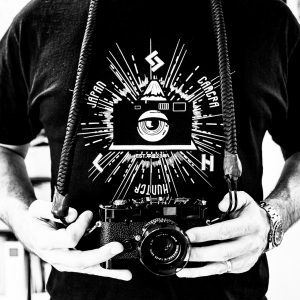 My name`s Mateusz, I`m Warsaw ( Poland ) based street photographer. I`m shooting street for over 5 years now. I`m founder of www.PolishStreetPhotography.com, a street photography community that works mostly on Facebook. I`ve participated in numerous group exhibitions but nothing solo yet. I`m not a traveller and most of my pictures are from Warsaw only. – Pentax MESuper coupled with rare SMC Pentax M 28mm/f2. I love this camera, we went through a lot of stuff and when i had the oportunity i had it signed by Bruce Gilden himself. Right now it sits on my shelf but sometimes i take it for a walk. – Pentax SuperA with SMC Pentax M 50mm/f1.7. I`d say it`s even better than MESuper. 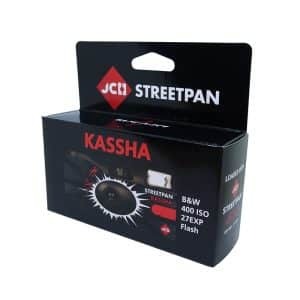 It`s deffinetly more comfortable to work with and the lens is superb for colour. – Bessa R3M with Voigtlander Nokton 35mm/f1.4 Classic. Best setup for rangefinder beginners. It`s not too expensive and you have the leica experience. I should get R2M for that lens but i liked the idea of 1:1 finder. Now i`m planning to get Nokton 50mm/f1.1 for that R3M and for 35mm the R2M. – Fuji X100 – WOW this is the camera that might turn me to the dark ( digital ) side of the force. I just got it a couple of days ago so it`s with me always since then. – Contax G2 with Biogon 28mm/f2.8 Incredible camera and the lens is superb. If they`ll make it digital one day i`ll be the first one in line for it. – And last but not least Pentax MX with SMC Pentax 35mm/f2. I`d say it`s SLR version of my Bessa setup, light, no need of batteries and a great way to start shooting manual cameras. 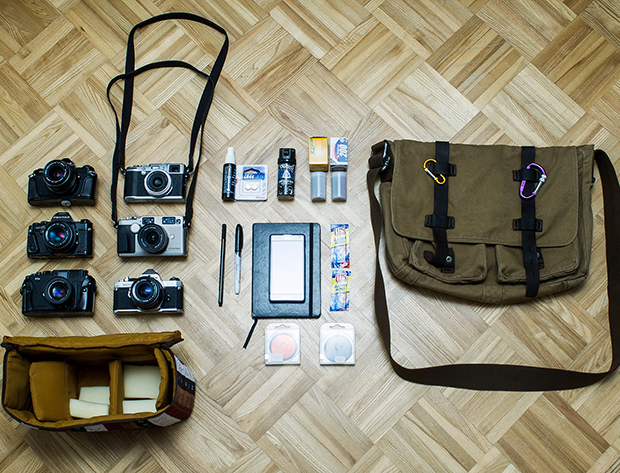 Obviously i don`t carry all those cameras at the same time. Right now it`s Contax G2 an Fuji X100. 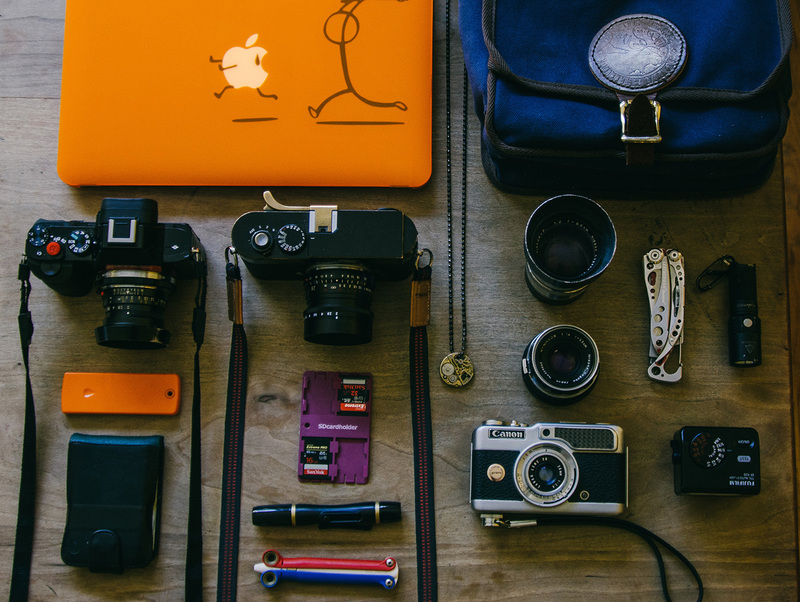 But quite often i take other cameras with me. It always depends on my mood and puprose of my pictures. – SuperOptik lens cleaning liquid – I`m quite slopy and verry often find my fingerprints on the lens. This comes with my Microfiber cloth (which i forgot to add to the picture) which i got as a gift from the owner of Leica store after an exhibition. 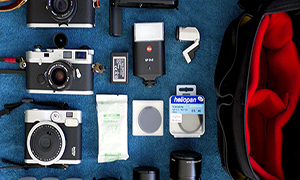 – Some batteries for the Pentax/Bessa cameras, i never remember which have fresh batteries so i just always carry some new ones. – Pepper spray for self defence. Happily i never had to use it, but i keep it in always open pocket in front of the bag. 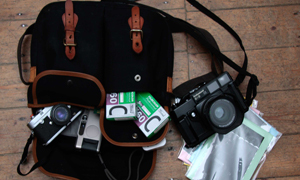 – Two rolls of Kodak TriX and two rolls of cheap 200ISO Colour negative just in case. I shoot BW most of the time but i like to have it just in case. – Pen for notes and Sharpie to note on the film canisters. I sometimes just roll back unfinished rolls and note how much frames i took. This way i`m not restricted switching the film only after 36frames. – Moleskin notepad, as there is always something to note or draw. – Some wet wipes for my glasses. – Two 52mm filters Orange and Polariser, they often come in handy when i`m shooting film. 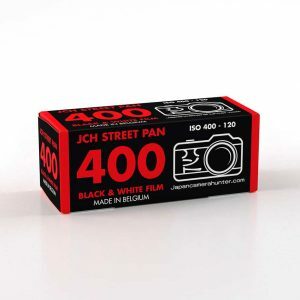 – In some near future i`m planning to buy JapanCameraHunter film case. And finaly the bag, It`s a noname cheap bag which i bough slightly used. It`s rather well made and holds my NG bag insert like a glove. 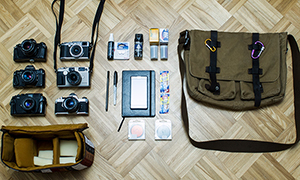 What`s important, it doesn`t look like a photo bag. In the insert i added four pieces of foam just to add some more safety to my gear. If you liked my bag please visit my blog: www.mateuszgfoto.blogspot.com. 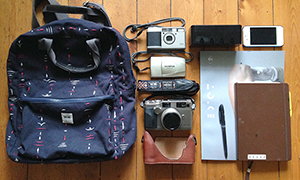 Thanks for sharing your bag with us Mateusz, that is a truly lovely selection of gear you have there. Keep safe. Hey ! I’ve got the same three siver cameras too ! The black ones are great too. The funny thing is that Pentax MX is smaller even than Bessa R3M ! 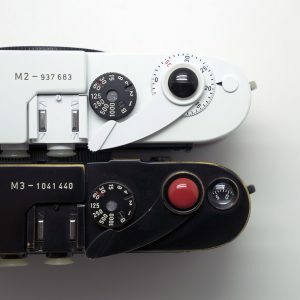 it was smaller than Leica M6. The stuff on the polish street photography website is really top notch. Nice cameras and photos to show for it. I digged the PSP webpage, the work i saw was absolutely beautiful, well made. it could have knowcked me down with a feather. So congrats to all of you for it. A small side note : the Super A can handle all the modern pentax lenses, and it’s a joy :D there is some underestimated jewels is the cheapo modern lenses, no matter the brand. Nice bag Nice package! and nice picture too. I’m commenting for a different reason however – nothing personal to you at all…but I got lost a little at the mention of Bruce Gilden. Bruce is not good for photography. He has a very arrogant and combative shooting style and one day he will photograph the wrong person and something really bad may happen. 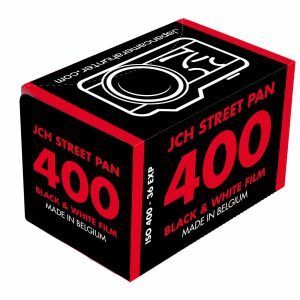 If that day comes (and I hope it does not) – it will be the beginning of a new and very very bad era for all street photographers everywhere. It doesn’t matter if his shots are interesting or if they good, his style will eventually create problems for ALL street photographers and I find it disappointing that he has been given a platform to speak at street photography conferences and is thought of a rock star in his field. Big cities particularly in the USA are already powder kegs for security/violence/privacy -all its going to take is one really bad member of the public vs arrogant street photographer to usher in new laws about what and who we can take a picture of. Sorry, the mere mention of Bruce Gilden immediately brings up that real possibility and quite frankly is very frustrating. So again nothing personal to you love the bag/cameras and nice pictures on your website too. I`m not affraid about Bruce Gilden as he`s quite gentelman and on the street is not at all as he was shown in those YT videos. He often laughs and jokes with the people that he shoots. He`s not as bold as people say he is :) I`m more concerned about new/young guys that are doin what they think is “Bruce Gilden style” shooting. Bruce aquired his aproach over many years of NY and worldwide shooting and knows how to deal with situations. Newbies don`t, they watched the video on YT and think that this is cool way of making pictures.